Russian Helicopters Mi-38 with Russian TV7-117V engines makes first flight. According to Ria Novosti, The second consignment of Russian weapons and military equipment, to be delivered to Iraq under the deal signed in 2012, will arrive later than previously announced, a senior Iraqi lawmaker said on Sunday. "The Mi-38's first flight is the successful result of collaboration between Russian helicopter constructors and engine-builders. 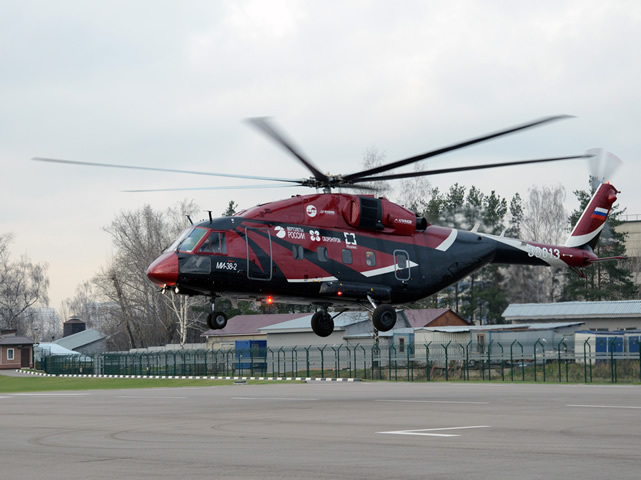 The Mi-38 represents a new generation of helicopters that provide the highest standards of safety and comfort," said Russian Helicopters CEO Alexander Mikheev. "Thanks to its TV7-117V engines, the Mi-38 has a significantly broader range of potential applications, which will give it an additional competitive edge and make the helicopter even more attractive to both existing and new customers." "The creation of the TV7-117V engines is one of UEC's core projects," said UEC CEO Vladislav Masalov. "The new engines deliver increased power and fuel efficiency. Construction of a test batch of the TV7-117Vs will begin shortly for certification testing, which is planned for the end of 2014." Certification of the Mi-38 is expected to complete in 2015. Serial production is planned for 2015 at Kazan Helicopter Plant, a Russian Helicopters company, where the fourth prototype of the helicopter - the final one before the launch of serial production - is currently being assembled. The fourth prototype will be fitted with a shock-resistant fuel system by Aerazur and enlarged window openings. Serially produced Mi-38s are planned to be fitted with Klimov TV7-117V engines.